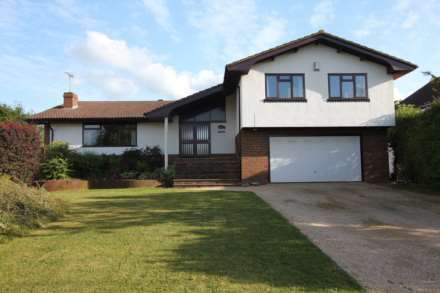 A well presented, link-detached, 4 bedroom modern house set in a peaceful and very convenient place to live. Backing onto a large meadow that has communal use solely by the residents of Waylands Close and is not open to the public. The interior of the property has been tastefully designed and fitted and maintained to a very high standard. The kitchen is beautifully fitted and forms part of a large conservatory with under floor heating and a wood burning stove. Bedroom 1 has a balcony enjoying superb views over the meadow belonging to Waylands Close. Special features: Large kitchen/breakfast room - a superb bespoke fitted kitchen with 5 ring Miele hob and Miele microwave ● Large Miele oven ● A second Miele integral oven ● Large fridge/freezer ● Lots of drawers and cupboard units ● Bespoke pantry ● Electrically operated cellar door leading to a circular cellar with spiral staircase, with lighting and power ● Utility room with Miele washing machine and Miele tumble dryer ● Study area off the kitchen ● Breakfast bar running the length of the granite work surface in the kitchen itself * Kitchen / dining area leads directly into the conservatory which has blinds to the ceiling, double doors to the garden and a wood burning stove with log store beneath. Garden: The gardens to the rear are safe and private and there is a gate leading directly to the meadow to the rear. Summary of accommodation: Entrance hall, cloakroom, kitchen/breakfast room with study area, sitting room, family room, conservatory with wood burning stove, garage, off-road parking. 4 bedrooms; 2 good size doubles, 2 good size singles. Bedroom 1 has an ensuite shower, dressing area and a balcony overlooking the rear gardens and the meadow. Ensuite bathroom to the guest bedroom. Family bathroom fitted with bath and shower. The landing has a study area with window overlooking the front garden. Local facilities: This area is known for fine restaurants and period pubs. Just down the road is The Bladebone pub with an excellent restaurant and garden and the Blackbird Café. There is a general store at Upper Bucklebury and a Post Office and general store at Southend Bradfield, both within a few minutes drive. Newbury and Reading are equidistant. Thatcham is only a short distance away with a Waitrose and a further selection of shops. Pangbourne is about a 10 minute drive with a wonderful selection of award winning independent shops, a small supermarket, health centre, dentists, library, hairdressers, pet shop, hardware store, riverside pubs and fine restaurants. There are excellent rail connections to Reading and London Paddington within easy driving distance and with parking facilities at Theale, Pangbourne and Thatcham stations. Theale to London Paddington is only a 45 minute train journey. The M4 Junction 12 at Theale connecting to London and Heathrow is only a 4 miles drive. The Sports Centre at Bradfield is 5 minutes drive away with its fabulous indoor swimming pool, indoor tennis courts, squash and fitness centre open to public membership. For the equestrians there are riding schools in the area with lots of bridle paths. Schools: within easy driving distance include Bradfield College, Pangbourne College, Cranford House, Moulsford Preparatory School for Boys, The Oratory School, Downe House, St Gabriels for girls, St Andrew`s Preparatory School, Brockhurst & Marlston House Schools, Elstree Preparatory School and Theale Green Secondary School. Directions: From the offices of Dudley Singleton turn left. Proceed over the mini roundabout, passing the front of The Copper Inn, and leave the village of Pangbourne in the direction of the A4. Pass over the M4 and then turn first right towards Bradfield. Pass through the heart of Bradfield, past the College, until you come to a War Memorial on a sloping T-junction. Turn left, proceed along the lane and turn left into Waylands at the large old house on the front, bear to the left and past the two gate lodges. Turn right and the property will be found almost at the end of the drive on the left hand side. Services: Mains water, electricity. Private drainage. Eswa warm-up electric floor and ceiling heating. Note: No commercial vehicles, boats or caravans to be parked outside the property. If suitable they must be parked inside the garage.